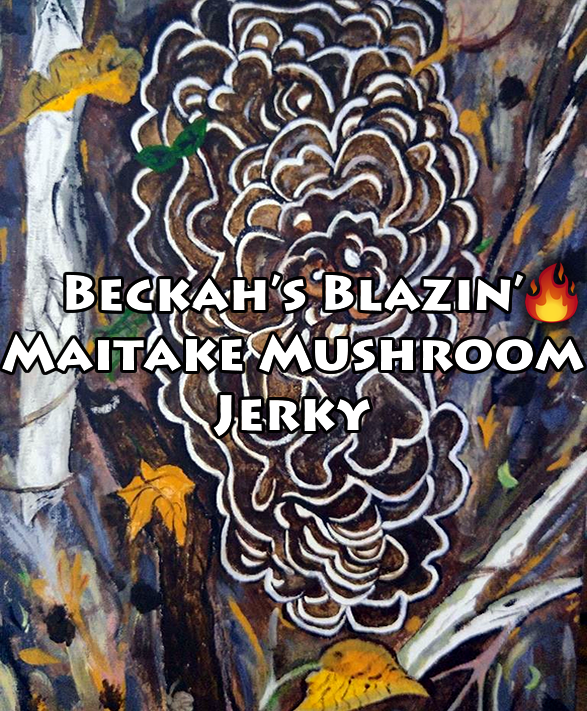 I want to share my favorite recipe for mushroom jerky with you. You can find these mushrooms in Asian markets or a local farmers market or find out if they grow near you. They can be found in the early fall, and are found at the base of large white oak trees. If you get your hands on one, I hope you will love this recipe. This recipe has been a BIG hit amongst my family and friends. They should be a little soft still when you pull them out because when they cool they will harden up a little bit. Different sized batches or different sized pieces of hen of the wood (maitake) may take different drying times. two-gallon size bags filled will work. Reduce the boiled mushroom water, save and freeze for an amazing soup broth! This recipe is mostly prep and patience but SO worth it,I assure you. 100xs better that any vegan store bought jerky I’ve tried. I’ve never tried jerky. The appearance honestly puts me off and I don’t say that about a lot. I’ll eat pretty much anything ha. This seems to be really popular in the us though. I’ll have to give it a go one day just to know what it’s like. Who knows I may surprise myself and like it. Great post! Thanks, if you like to spice it is great. Before I went vegan I enjoyed jerky so this has easily become my favorite cruelty-free go-to recipe for it. I’ve never tried jerky before (thank god), but I like the majority of mushroom dishes so I bet I’ll love this! Love this recipe! I upped the pepper, red pepper, and a bit of Tabasco with the sriracha (I’m a spice guy) and bit was incredible. My friends and family also loved it. Thanks for sharing!